A typical AUTO record mode screen display. 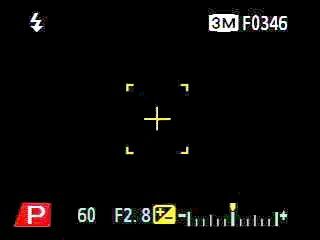 Icons on the top indicate the flash is in auto mode, image size is 3 megapixels, "F"ine quality and 346 pictures remaining, along the bottom is the shutter speed 1/60 sec and the aperture is F2.8. In AUTO mode you can select the image size and quality, flash mode, enable the selftimer, the Voice Memo mode, select AF or manual focus. This is quick and easy "point-n-shoot" mode. Screen display in Program AE mode. Looks the same as AUTO but when you press the MENU button there are a many options that can be changed. See the next frame for the exposure and camera options available in Program AE, Shutter speed priority, Aperture priority or Manual mode. 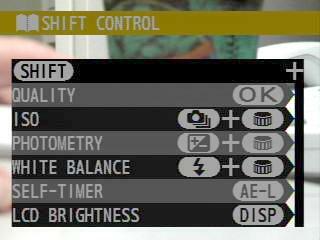 With the Mode Dial on the SP (Scene Program) setting you can quickly choose one of five scene modes using the Command Dial. Choose from Portrait, Landscape, Sports, Night Scene or B&W. To override the metering system you press and hold the "+/-" button on the top and rotate the Command Dial. This is the on-screen display showing the +/-2EV range. You can manually select one of 49 focus areas by pressing and holding the AF start button and moving the AF target marks with the 4-way selector. The screen is divided up into 7 rows by 7 columns and any one of those points can be selected. Note that regardless of the AF focus area, the exposure is always based on the center of the frame. You can set the exposure for the selected AF point by using the AE-Lock function and then recomposing the frame. Manual Focus lets you adjust the focus by turning the ring on the lens barrel. To aid in critical focusing press the Focus Check button to magnify the center 50% of the display. While turning the ring you will see a yellow arrow point left or right - the direction to turn the focus ring to get the right distance. When you get it just right a yellow circle icon will appear. To assist manual focusing there is a One-Touch AF button (in the center of the AF/MF switch) to get you near the proper distance quickly. In any record mode other than AUTO or Movie mode you can press the INFO button on the side to display the exposure compensation value, white balance, metering, ISO speed and image sharpness settings. The S602 Zoom's Super Macro mode allows you to shoot from 0.4 - 7.9 inches. 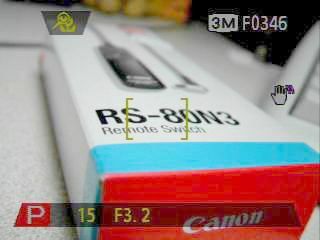 There's also regular Macro mode with a range of 0.3 ft - 2.6 ft. The S602's movie mode is capable of capturing full motion video with audio at 30 frames per second in 640x480 VGA or 320x240 QVGA resolution. The length of these movies are limited only by available storage space. As with most digicams that offer a movie mode with sound, you cannot zoom during capture but you can set the zoom where you want it before you begin to record.